Slow down to Island Time at this cute 1 bedroom condo in Treasure Island. Point Capri complex is located 5 minute walk to the beach and on the intercoastal waterway. There is a dock for fishing, a perfect spot to see dolphins and manatees swim pass while cooling off at the pool. A newly furnished, light and airy floor plan with a full-sleeper sofa and a sweet sun-porch: Updated kitchen, microwave, stove/oven, full refrigerator; a full updated bath inlcudes a shower/tub combo. Condo includes: Bath towels/bed linens; starter set for toilet paper;coffee/condiments;paper towel;bath soap. One (1) assigned parking space. 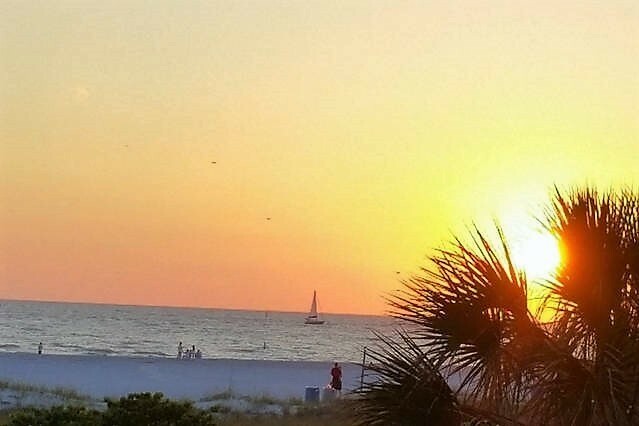 The condo complex- Barbeque and dine at the canal-side patio, gas grill, splash in the pool, or take a short, two-block walk to Treasure Island's widest beach on the Gulf of Mexico; laundry on-site. Looking for more fun: Loads of bars, bistros, boat rentals, bike rentals, and shops are walking distance along Gulf Boulevard. Our favorite for a feel of spring break (literally for all ages) is Caddy's, a mile south. Enjoy this beach front, open air bistro inside, or out on the sand. Want a walk-around venue? John's Pass is a mile to the north. It's at a gulf/intercoastal connection offers a number of restaurants, shops and just plain fun for all ages. Please contact me with information regarding Pointe Capri 15. This condo was super cute and very clean. It was a great place for our family to relax for the week. We enjoyed spending our days at the beach, swimming in the onsite pool, and watching for marine life in the bay. The beach and restaurants were just a short walk away. We would definitely stay here again.